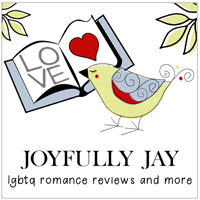 Jeff & Will have completed their move and have news about Love, Simon, TJ Klune’s new YA trilogy, Romance Writer’s of America awards and Eastsiders. New patrons Jennifer, Lita, Olivia, Jules and LizaStar are welcomed. Will reviews books from K.C. Wells and A.R. Barley while Jeff has one from Lucy Lennox. The film Every Day and the new NBC series Rise are also discussed. Jay from Joyfully Jay stops by to preview the site’s upcoming paranormal theme week, which begins April 9. She also recommends books by Lily Maxton, Morgan Brice and Lisa Henry & J.A. Rock. She also gives a shout out to Love, Simon. Rabbit Trails by Hollis Shiloh is the rabbit shifter book I’ve read a few times.